My dad found this bottle in our yard. and We live in West Virginia . It's clearish, with a man's face with glasses and a farm behide the picture. How old is this bottle and Where did it come from? he also found another that was tall, brownish, and only says "federal law forbids sale or reuse of this bottle". like on the other one. 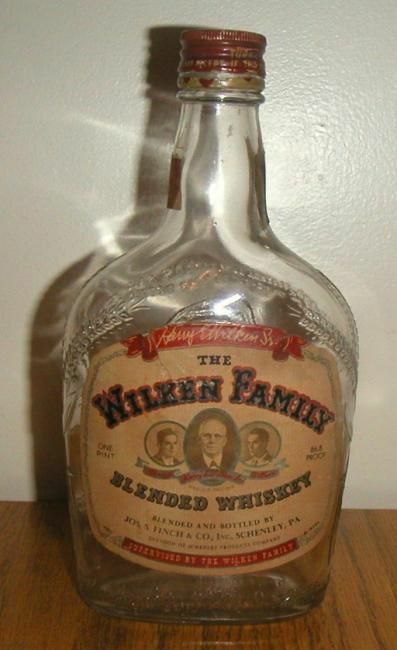 on the base of the bottle of the clearish bottle, it says '' R679 55 (a symbol im not sure of) 6 M16 45 " on the bottom of it it says " 14 Harry E. Wilkem or Wilken Jr. (and it says more things but i can't understand them.) then WILLIAM T. WILKEN. I have posted a photo of what I presume is your bottle - the label is helpful for identification - looks like it did not travel too far from its point of manufacture.